Humor serves a zillion purposes, from breaking the ice to coping with stress or sadness. Laughter is a miracle drug. The power of humor in presentations is immense. There are several practical reasons to use humor when you present beyond just wanting to seem funny. Here are some of the ways it can help. 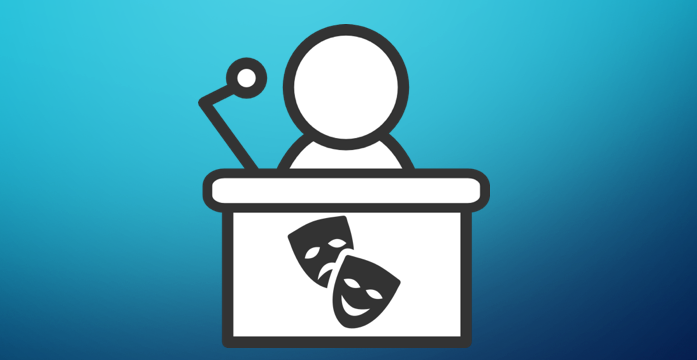 Humor is a fantastic way to keep your audience engaged in your presentation. Fun fact: it's impossible to fall asleep while laughing. If you have them on the edge of their seat waiting for your next killer punchline, consequently, they'll also be paying attention to whatever else you're saying. Don't people seem just a little more human when they crack a joke? It reminds you that a real person exists outside of that context. Further, we traditionally joke around with people we feel comfortable around, like our friends and family. Thus, when someone makes a joke, we automatically let our guard down a little and like the jokester a little bit more. Humor is scientifically proven to help people remember. This is because humor can be a way of providing clarification or connecting two topics. In school, the students who do the best are the ones who can connect and apply concepts across different classes; it helps them contextualize and reinforce the information. Similarly, if you're talking about aerodynamics and somehow make a joke that relates that concept to brushing your teeth, now you've got them thinking because they'd never made that connection before. Laughing at the same joke as someone else means that you have something in common: your sense of humor. As superficial as this connection may seem, laughter is scientifically proven to create a sense of community. Think about the last time you were in a crowded elevator or room, someone made a joke, and everyone laughed. Didn't you feel like you knew those people a tiny bit better? Think of how you feel after you walk out of the movie theater after a serious dramatic film vs. after seeing a gut busting comedy. After the comedy, you feel lighter and cheery as opposed to heavy and sullen. If you get even one good laugh out of the audience, they're going to walk out of that presentation with, if nothing else, fond memories of how they felt when they laughed. That ain't a bad way to be remembered.